Length: between 2 and 3 cm long. Appearance: Yellow and black striped abdomen, brown thorax, 4 wings. Life span: Hornets hatch in spring and die at the end of the autumn The queen survives over winter. Habitat: They live in tree trunks, bushes, barns, granaries or hollow walls. Diet: Live insects and sap. Not attracted to human food. 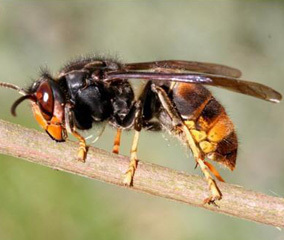 The hornet is a large insect, 2 to 3 cm long, it has two pairs of wings, enabling it to fly up to 21km/h. Its abdomen is striped with black and yellow bands, its thorax is brownish, its antennae short and detached from the body. On its large heat its elongated eyes contain thousands of facets. Length: between 10 and 19 mm long. Life span: Queens lay eggs in the spring which hatch in summer as female workers and die in winter. Habitat: lives in attics, wall cavities, disused rodent burrows, hollow trees and bushes. Diet: insects and sugary food. 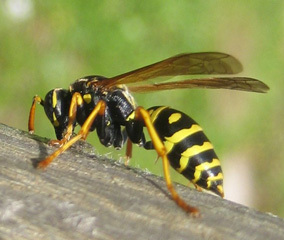 Wasps are between 10 and 19 mm in length with a head that includes mandibles and a pair of antennae, compound eyes and three infrared ocelli (simple eyes), a thorax with six legs, 4 membranous wings and a black and yellow striped abdomen with at its end a sting connected to a venom gland. 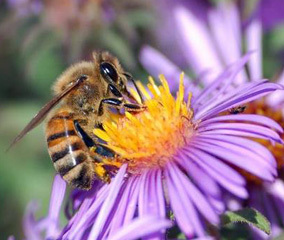 It is important to know that bees are protected, not treatment is authorised to eradicate them. When you discover bees, you must call a bee keeper who will come and retrieve them.